What unique design would you like a piece of custom hand painted furniture? 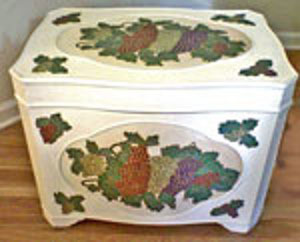 We can create any design requested to create a custom quality piece of hand painted furniture that will last a lifetime! What a great conversation piece when you display a custom painted piece of wood furniture in chairs, tables, chests, dressers and so much more. When a customer requests certain pieces of unfinished solid wood furniture custom painted, they might provide us with samples of wall coverings, fabrics, and other design elements so that we can match exactly what they want. This is our creative process from which we work from to design a piece of furniture that will compliment other pieces in the room. Clearly Susan offers custom painted furniture from one-of-a-kind find from the unfinished wood of the highest quality. We offer many styles and unusual pieces pieces of furniture that can be completely customized for your home. We will work with you to choose the perfect color & finish to coordinate in your room. Clearly Susan will find the perfectly hand painted furniture piece for you and then custom paint it to bring your vision for your home to life. To get the custom painted furniture project started we begin with the design phase. We find out the customer's personal interests.